LIVINGSTON, Scotland- 9th April 2018– Elite Control Systems Limited, who specialise in delivering full turnkey PLC & SCADA solutions and engineering support services spanning a range of Industries throughout the world, is pleased to announce that David Pollock has been appointed as Field Sales Manager for the company. 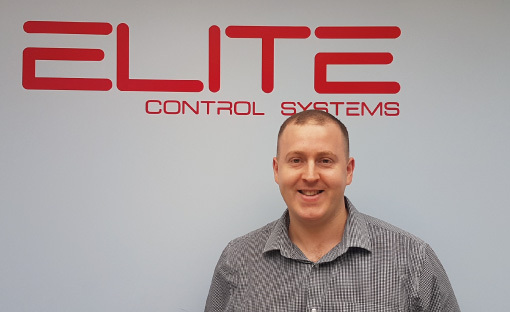 The decision to bring David on-board within the Sales development team is part of Elite’s plans to further strengthen its market niche as one of the UK’s leading providers of Engineering Support Services, tailored to suit a wide range of Industries. “My goal is to raise awareness of Elite’s capabilities among Industries such as Food and Beverage, Oil and Gas, Power, etc, of the expanding portfolio of solutions Elite can offer.” “There is so much more companies can do to protect their Industrial Assets, especially in today’s IIOT (Industrial Internet of Things) culture, where great emphasis is being placed on issues in Cyber Security and Obsolescence Management. Having previously spent 5 years in Process Instrumentation Sales, I now look forward to opening new opportunities within Control System Integration in this exciting new role” said David. In his role as Field Sales Manager, David is responsible for cultivating relationships with both existing and prospective clients throughout the UK. Originally from Hamilton, David will be based at Elite’s Headquarters in Livingston and reports to the General Manager, Brian Sneddon. “David is perfectly suited to his new role and holds a Bachelor’s Degree in Product Design Engineering along with his previous experience working as a Field Sales Engineer across Scotland” said Brian. Elite’s extensive portfolio of Food and Beverage clients include Edrington Group, A.G Barr, Diageo, Glenmorangie, North British Distillery, Whyte & Mackay, Quaker Oats, etc. Elite also serves numerous Energy providers such as Scottish Power and ScottishPower Renewables along with major Manufacturing companies like Tarmac and Liberty Steel. Elite Control Systems was established in 1992 and is based in the new town of Livingston, just outside Scotland’s capital city of Edinburgh. Elite is a highly regarded innovative company focused on delivering full engineering support services to the highest standard with expertise and experience delivering full turnkey solutions and engineering support services for clients spanning a range of Industries including Food and Beverage, Bottling and Distilling, Oil and Gas and Energy.